beach north of San Francisco, also includes Sayulita, Punta de Mita, Marieta Islands, La Cruz de Huanacaxtle, Nuevo Vallarta, Puerto Vallarta, Los Arcos, and Majahuitas Quimixto, among other things. Some activities that may be performed include golf on any of the 7 golf first level already operating in the area, diving, snorkeling, whale watching, horseback riding, and many more activities. Lovers paradise surfing tourists, Punta de Mita is on track to become a major tourist center. 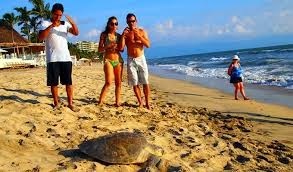 Located just 50 km from the popular port of Puerto Vallarta, Punta de Mita beach remained a virgin until a few years ago. Today there are impressive developments such as the Four Seasons Resort, with its extraordinariose has become a destination "elite" in Mexico. Currently, groups of archaeologists working in the discovery of archaeological sites of the ancient inhabitants of this beautiful place. The Indians who lived here and left a legacy in the inscriptions on rocks, remains of buildings and ceremonial centers and some artifacts belonged to the Early Postclassic period. Upon arrival of the Spanish, this civilization was in decline because its position on the trade route to the plateau was replaced by new ports. Currently, Puerto Vallarta is the second beach resort in Mexico, behind only Cancun. Because of this popularity, the state government promoted tourism development in Nuevo Vallarta, located just 45 minutes from downtown Puerto Vallarta. Puerto Vallarta is located in the neighboring state of Jalisco, though the proximity of Nayarit also make it an attraction for people visiting Nuevo Vallarta Nayarit well. The Marina of Puerto Vallarta is famous for its fishing tournaments. In the center bars, restaurants and nightclubs enliven every night of the year. Furthermore, the best hotels and tourist resorts offer accommodation of the highest quality. One of the most important archaeological sites in western Mexico, Los Toriles was inhabited from 300 BC approx.